Visualizing the correlations between variables often provides insight into the relationships between variables. 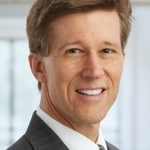 I've previously written about how to use a heat map to visualize a correlation matrix in SAS/IML, and Chris Hemedinger showed how to use Base SAS to visualize correlations between variables. Recently a SAS programmer asked how to construct a bar chart that displays the pairwise correlations between variables. This visualization enables you to quickly identify pairs of variables that have large negative correlations, large positive correlations, and insignificant correlations. In SAS, PROC CORR can computes the correlations between variables, which are stored in matrix form in the output data set. 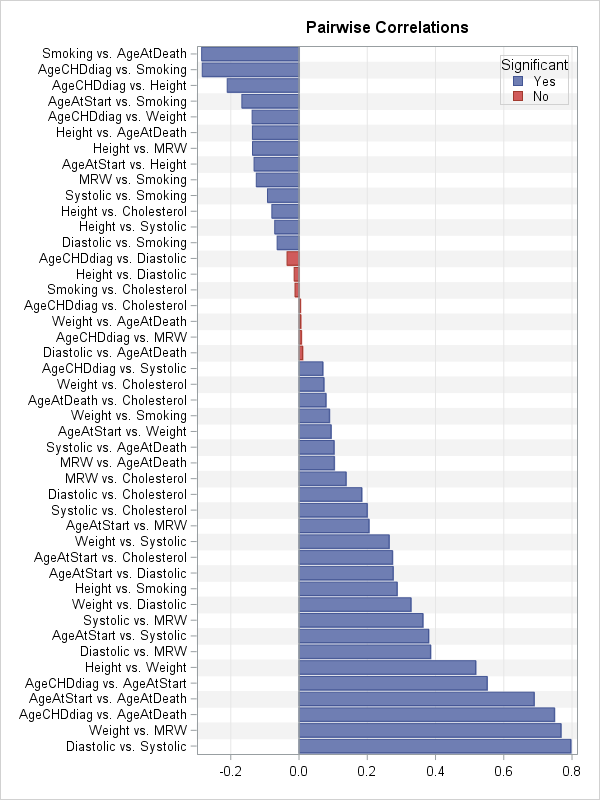 The following call to PROC CORR analyzes the correlations between all pairs of numeric variables in the Sashelp.Heart data set, which contains data for 5,209 patients in a medical study of heart disease. Because of missing values, some pairwise correlations use more observations than others. These shortcomings are resolved if you present the pairwise correlations as a bar chart. To create a bar chart, it is necessary to convert the output into "long form." Each row in the new data set will represent a pairwise correlation. To identify the row, you should also create a new variable that identifies the two variables whose correlation is represented. Because the correlation matrix is symmetric and has 1 on the diagonal, the long-form data set only needs the statistics for the lower-triangular portion of the correlation matrix. You can use the HBAR statement in PROC SGPLOT to construct the bar chart. This bar chart contains 45 rows, so you need to make the graph tall and use a small font to fit all the labels without overlapping. The call to PROC SORT and the DISCRETEORDER=DATA option on the YAXIS statement ensure that the categories are displayed in order of increasing correlation. The bar chart (click to enlarge) enables you to see which pairs of variables are highly correlated (positively and negatively) and which have correlations that are not significantly different from 0. You can use additional colors or reference lines if you want to visually emphasize other features, such as the correlations that are larger than 0.25 in absolute value. The bar chart is not perfect. This example, which analyzes 10 variables, is very tall with 45 rows. Among k variables there are k(k-1)/2 correlations, so the number of pairwise correlations (rows) increases quadratically with the number of variables. In practice, this chart would be unreasonably tall when there are 14 or 15 variables (about 100 rows). 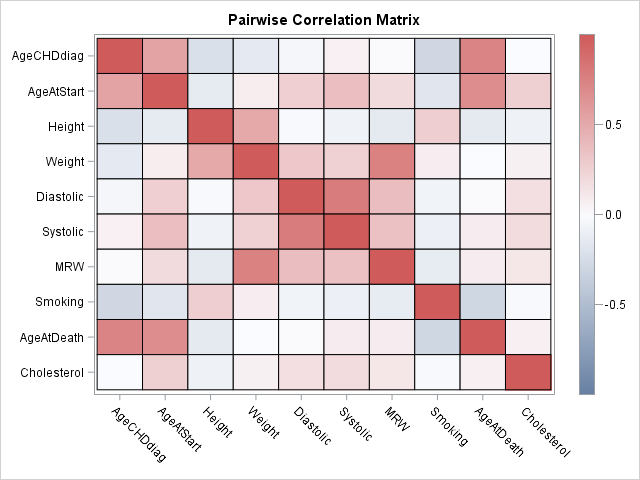 Nevertheless, for 10 or fewer variables, a bar chart of the pairwise correlations provides an alternative visualization that has some advantages over a heat map of the correlation matrix. What do you think? Would this graph be useful in your work? Leave a comment.